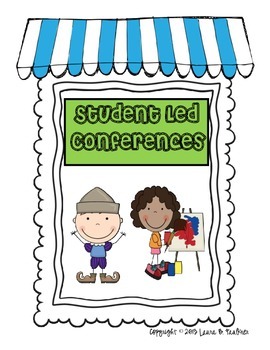 This is such a fun way to engage students and parents for conferences! I used this conference format when I was teaching 4th grade. It really gave the student ownership of their learning while engaging the parent/guardian in a new way. 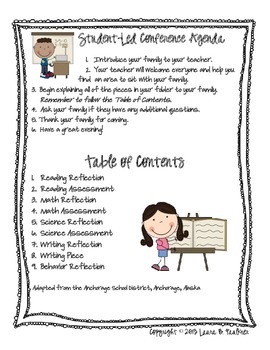 In my classroom, I would have the students complete the reflection and underneath the paper, he or she would then have an assessment or classroom activity that they wanted to highlight for that content area. 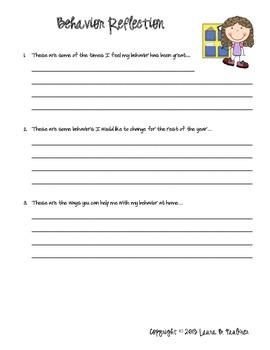 When it was all complete, the student would have the Table of Contents, the Agenda, a reflection for each content area, an assessment or activity for each content area, and finally a behavior reflection. This type of conference is my favorite to host because the students get to talk with their parents in a way that is different for all parties involved. I hope you enjoy! 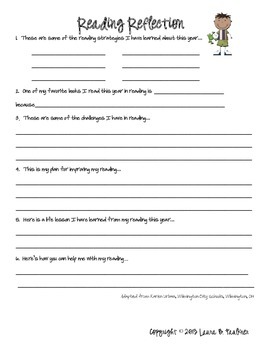 Check out my math assessments for 3rd and 4th grade! If you would like to contact me for any changes, please email me at lbfaulkner76@gmail.com Thank You! !